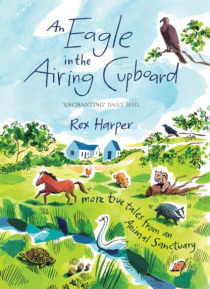 AN EAGLE IN THE AIRING CUPBOARD picks up where Rex Harpers first book, AN OTTER ON THE AGA, left off. It follows the fortunes of the Cornish RSPCA centre through one of its most testing twelve months. Once more it is a mixture of funny, touching and sometimes moving animal stories. And once more it features a cast of unforgettable characters, like Alfie and Blue, two hideously mistreated greyhound… s that are rehabilitated at the farm, as well as the return of old favourites from Rex's first book, including his loyal dog Moss. Throughout, Rex evokes the sights, smells, sounds and spirit of the Cornish countryside in all its timeless beauty. He also encounters sickening cases of animal cruelty committed by humans unfit to care for any living thing. Funny, warm and evocative, it is a book that is, once more, set to melt and occasionally break the hearts of animal lovers everywhere.